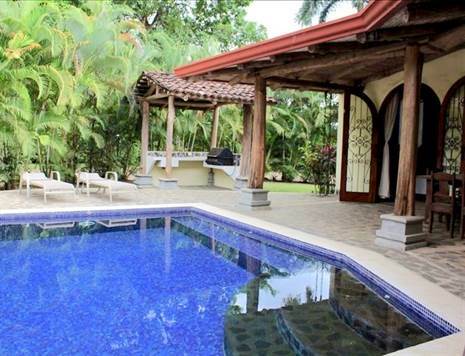 This Villa has it all - tropically landscaped grounds, beautifully tiled indigo blue swimming pool, private outdoor terrace, BBQ gazebo, plus a separate guest house with full kitchen, 1 bedroom and 1 bath. There’s also a garage for your car. The main house is open and spacious with 2 large bedrooms, 2 baths and living room that opens to an outdoor covered terrace for dining, BBQs or just enjoying the breezes. If you like to cook, you'll love this kitchen; fully equipped with a bar separating the living room. Please call or email today if you would like more details on this property.